You can use cPanel's Cron Job feature to run Unix commands and/or automate the execution of your PHP, Perl, or Python Scripts. You can also specify an email address that the Cron daemon will send the job's results to. Scroll down until you find the Advanced section. 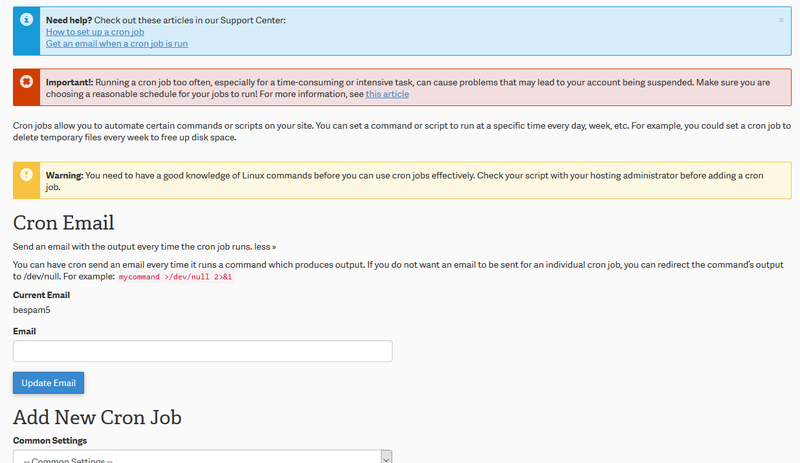 Click on Cron jobs. This will bring you to the Cron Jobs page. The "mycommand" would be replaced by your command. This will run every morning at 4:41AM. The * is a wild card, meaning "every day/month, etc" For example; 41 04 * * * = every 41 minutes of every 4th hour of every day of every weekday of month. Weekday is every day of the week including the weekends. Many customers have thought that weekdays are only Monday - Friday, instead of interpreting it as Monday - Sunday. When setting the time, it is also good to set the cron to run at an odd minute, instead of the top (example: 12:00) or bottom (example: 12:30) of the hour. The example above runs at 4:41. The reasoning behind this is that most people set their crons to run at either the top or bottom of the hour. If everyone runs their crons at the same time, this can cause the crons to run slow and even slow the overall server down for regular website traffic. Setting it at an odd time ensures better performance of the script. The script will need to be called on its direct path as it is located on our server, so it will be something similar to: /home/userna5/public_html/path/to/script, with "userna5" being your username. perl/cgi scripts should be in your cgi-bin, with permissions of 755. In this case we defined our curl User-Agent to be cPanel-Cron, you can set it to be whatever you'd like, so long as it is defined in your cron command as something.